A proven, rugged range of linear positioning stages with travel range from 50 to 300mm. High accuracy ground ballscrews and cross-roller bearings are standard. Adjustable magnetic limit and datum switches are integral within the stage assembly. Stepping motors or closed loop servo motors, with rear-mounted encoders or linear scales, provide position feedback. 250mm width option for greater stability is available. A wide range of MotionLink positioning indexers and controllers are available to control individual stages or multi axis configurations. Using rail bearings and ground ballscrews, the Series 2000 stages offer load-bearing capability, long travel with high accuracy, repeatability and economy. Travel ranges in excess of 500mm make the Series 2000 exceptionally flexible for special designs. Adjustable magnetic limit and datum switches are integral within the stage. Stepping motors or closed-loop servo motors with rear-mounted encoder or linear scale feedback are all compatible with the Series 2000 stages. A wide range of MotionLink positioning indexers and controllers are available to control individual or multi-axis configurations. Complete mechanical fixture design is also available to specific requirements. Using rail bearings and ground ballscrews, the Series 2500 stages offer good load-bearing capability and long travel with high accuracy and economy. Travel ranges of up to 500mm make the Series 2500 exceptionally versatile and the hard top cover provides protection for the stage and other equipment. Adjustable magnetic limit and datum switches are integral within the stage. Stepper or servo motors may be fitted. Designed for those applications where height is at a premium, the Series 2750 cross roller stage is a precision stage for use where accuracy and quality are important. Using high specification cross roller bearings and a precision ground ballscrew, these stages offer accurate control of position, well suited to microscope operation and optical positioning systems. Limit and datum switches are fitted. All switch, motor and encoder connections are made through a 15 way D Type connector. The Series 2750 is available with stepping motors, or servo motors with encoders as required. With miniature rail bearings and a 1mm pitch ground G0 ballscrew, the Series 3000 linear stages offer a compact design with travels of 25, 50, 75 or 100mm. Fitted with either Size 17 stepping motors or miniature servo motors with rear-mounted encoders, they offer resolutions to 0.1 microns. Mechanical limit and datum switches are integral within the stage. All connections are securely made through a single 15 way D connector. A wide range of MotionLink positioning indexers and controllers are available to control individual or multi-axis configurations. Based on the popular series 3000 stage, the series 3500 is a compact design with miniature rail bearings, GO 1mm pitch ground ballscrew and is available with travels from 25 to 100mm. 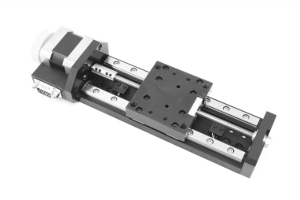 With a robust cover protecting the ballscrew and rail bearings, the series 3500 linear stage offers a stable and accurate solution to many positioning requirements. It is possible to specify either 17 frame size stepper motors or small servo motors with attached encoders, offering resolutions to 0.1µm or better. Integrated mechanical datum and limit switches are common to all models and connections are made by way of a 15Way D Type connector. 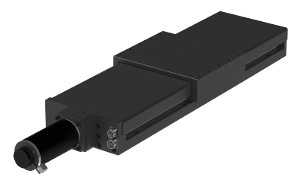 The series 3750 linear stage is a compact design with miniature rail bearings, C7 accuracy 1mm pitch ground leadscrew with anti-backlash nut and is available in travels from 25mm to 150mm. The series 3750 stage offers a compact solution to many positioning requirements. Normally fitted with a 17 frame size stepper motor, it is also possible to specify small servo motors with encoders, offering a wide range of solutions depending on the application. Integral mechanical limit switches are common to all models and connections are made by way of a 15Way high density DType connector. Designed for compact, low-profile and high accuracy applications, the Series 4000 stages use crossroller bearings and precision G0 ballscrews mounted to one side. Travel range is 25 to 200mm. This design allows the mounting of high accuracy linear scales, protected, within the stage assembly, on the side opposite the ballscrew. The ratio of base thickness to stage envelope ensures a superior, trajectory performance. Limit and datum switches are also integrated within the stage. High resolution stepping motors, up to 125,000 steps per revolution, or servo motors, are mounted on an adaptable motor mount assembly. All connections are securely made through a single 25 way D connector. A wide range of MotionLink positioning indexers and controllers are available to control individual or multi-axis configurations. Where heavier loads requiring greater stability must be moved, with accuracy and stable velocity, the Series 12000 stages will perform that task reliably. With a 250mm base width, single and multi-axes configurations are available for demanding applications. 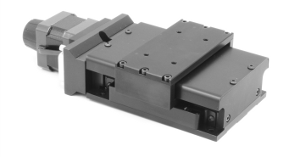 Using high load capacity, four journal rail bearings and a high precision ground ballscrew, these stages offer accurate control of position suited to laser machining and optical positioning systems. Limit and Datum switches are fitted. Switch, motor and encoder connections are made through QM connectors. Available with stepping or servo motors with encoders. Linear encoders internally fitted are an option. Protective bellows fitted as standard. Where heavier loads requiring greater stability must be moved with accuracy and stable velocity, the Series 12000 stages will perform that task reliably. With a 250mm base width, single and multi-axis configurations are available for demanding applications. 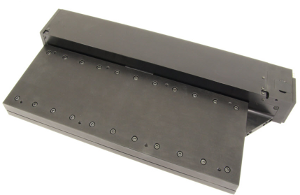 Using high load capacity four journal rail bearings and a high precision ground ballscrew, these stages offer accurate control of position suited to laser machining and optical positioning systems. Limit and datum switches are fitted. Switch, motor and encoder connections are made through QM connectors. The Series 12000HT is available with either stepping motors or servo motors with encoders and internally fitted linear encoders are also an option. The hard top cover is fitted as standard. Our full Catalogue is available to view or download as a PDF.